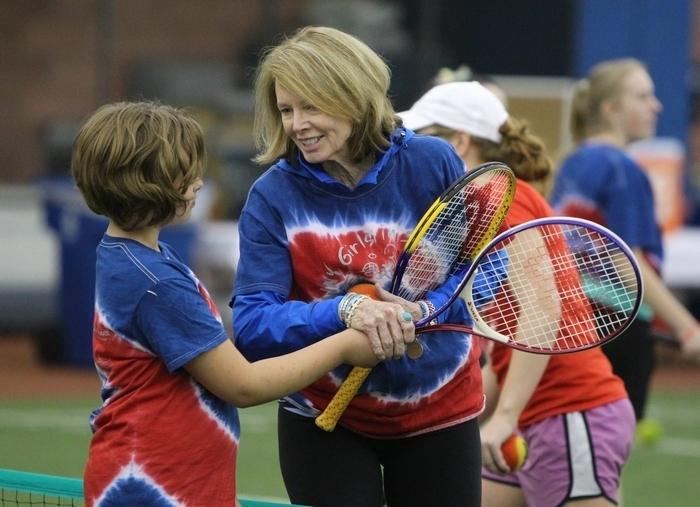 Inspiration was the theme of a two-hour workout session Mary Wilson hosted Saturday for about 250 girls at the Buffalo Bills’ field house in Orchard Park. The event was part of a program for girls to participate in sports that she started in 2006. It’s a twice-a-year clinic that allows girls ages 9 to 12 from the Buffalo Public Schools to practice a variety of different sports under the supervision of local volunteers. Wilson is now the owner of the Bills since the death of her husband, Bills founder Ralph C. Wilson Jr. She said her husband eagerly embraced the program once she proposed it to him nine years ago. The girls spent the afternoon rotating through seven different sports stations, including rowing, basketball, golf, volleyball, soccer, running and tennis. Wilson is a former world-class tennis player. In 1976, she participated in the Wimbledon Championships, the world’s most famous major tennis tournament. (She lost in the second round.) She said the program helps motivate girls to want to join teams when they get to the high school level. The Bills partner with the United Way of Buffalo and Erie County in organizing the event. The Bills donated $2,000 to each of the groups that brought volunteers to the field house. They included the West Side Rowing Club, the First Tee of Western New York golf program, the Buffalo Soccer Club, the Girls on the Run character-development program, the University at Buffalo, Canisius College and Medaille College. Wilson did not address any questions unrelated to the clinic.